The Kornati islands are the most indented island group in the Mediterranean, consisting 89 islands, islets and rocks emerging from the beautiful Adriatic sea. They are located in the north part of Dalmatia, South from Zadar and west from Sibenik, and in the sea, between the islands of Dugi otok, Zirje and Pasman.They are sometimes even called the stone pearls of the Mediterranean, and the protected area of the park counts for a total of almost 220 square km. The park and archipelago itself got the name after the largest of islands, called Kornat, and all of the islands are divided into two groups, the Kornat and Piskera chain of islands. The islands and the ground are not the only value of the park, the waters surrounding the park represent a great value as well. The sea is so clean and translucent, and in it you can find a few different species of corals, a big fond of biodiversity. There is a legend going round about Kornati, it is that while God was creating the world, he was left with some unused white rock. He then used them and threw them in the sea, concluding that it is perfect and that there is nothing to be repaired. Close to the Kornati Islands, there is Telascica Park of Nature, proclaimed in the 1988. and located on the island of Dugi Otok, full of wildlife and sea fauna, so you can be sure you wont be missing on any natural wonders in this area. Krka is a one of Croatia’s national parks, named after the river Krka that runs through this area. It is located in central Dalmatia, just a few kilometers away from the city of Sibenik, and it was proclaimed as a national park in 1985. to protect the Krka river. For the most part, the flow of Krka is calm, running around the Dalmatian karst anc creating beautiful cascades and lakes. One of the most recognizable lakes of Krka is the Visovac lake that has a small island of the same name in the middle, housing a small church and a monastery. The most famous cascades are the Bilusca buk, Brljan, Manojlovac, Rosnjak, Miljacka slap, Roski slap and Skradinski buk, all very deserving of the reputation of their beauty and the rich sounds that the water creates while it rumbles across it in seconds. The highest waterfall is Manojlovac, with height of almost 60 meters and the individual cascade reaching for over 30 meters. The waterfall called Roski slap is unique for its dimensions, being wide for 450 meters and 650 meters long. There was a water mill complex built on its cascades, and it is now considered to be one of the most attractive ethnographic locality of the Dalmatian hinterland. You can even see some medieval fortresses above the river, such as the Trosenj or Necven. You can get a great experience in the park, with educational trails, places of sightseeing and educational hiking trails. The flora of the park has some Mediterranean species, and fauna includes fourteen endemic fish species of the Adriatic. You can even go for a swim in the river- just take care and don’t get too close to the waterfalls. The Plitvice Lakes National Park is one of the oldest national parks in the South-eastern part of Europe, and it is the largest national park in Croatia, founded in 1949. It was also added to the UNESCO’s list of World Heritage in 1979. It is located in the karst area in central Croatia, on the border to Bosnia and Hercegovina, and the protected area covers almost 300 square kilometers. There are 16 gardens of larger lakes and some smaller ones, connected by cascades and surrounded by the forests of mountains, with water running around and creating most beautiful shapes- Plitvice are truly a geological and hydrological phenomenon. The tufa cascades are created because of the science, bacteria, algae and mosses conditions, along with good climate conditions and the flow of intense waters. This process is continuous, resulting in the constant changes of the lakes and creating some wonderful natural constructions. There is even the highest waterfall in Croatia, special because it is the only cascade that doesn’t start in a lake and doesn’t end in a lake. Plitvice lakes is truly a place to experience with your own eyes, beautiful in every season of the year, so don’t hesitate to witness this. Mljet is located more to the south and east than other larger islands in the Dalmatian region of Croatia. The national parks is the oldest protected marine area of the Mediterranean, founded in 1960. The national park includes the west part of the island, the Great Lake with the isle of St. Mary and Small lake, the Soline Bay and also a sea belt including some cliffs and islets, that is 500 meters wide and that covers an area of over 50 km of untouched nature. The lakes are two deep bays filled with water from the sea, and they are the most famous locations of the park, and important phenomenons of geology and oceanography. The park has some cultural heritage, as well as numerous endemic and endangered species, pointing at why it is so important to protect and preserve this area. There is a change between high and low tides that makes the sea current change direction every six hours, a dynamic exchange that resulted in the biggest Mediterranean colony of corals at the entry to the Great lake. The Small lake is special for the phenomenon of whitings- something that usually occurs in tropical systems, like the Bahamas. There is so much beauty in this national park- you just have to see it to believe it. 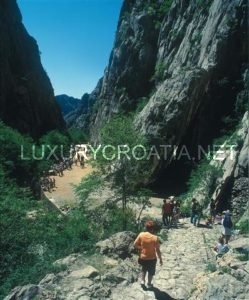 Paklenica is a karst river canyon, located in Starigrad, in the north of Dalmatia, not so far from Zadar on the south slopes of Velebit mountain. The north part of the Velebit mountain ( the largest one in Croatia ) is also protected as a secluded national park, covering an area of 109 km square, and the whole mountain of Velebit is protected as a Nature Park. Paklenica name comes from the autochthonous black pine forest, called “paklina”. There are two canyons, the Big Paklenica ( that has an artificial cave complex) and the Small Paklenica (which has no water flowing nowadays). The unique natural wonders, forests and geomorphological constructions are the reason that the area was proclaimed as a national park in 1949., as well as the efforts of preserving the forest complex from overexploitation. Another protected area not so far away is the Risnjak National park , located around 15 km from the Adriatic sea and covering the space of over 60 km square, located in Gorski kotar, the region with most mountains and forests in Croatia. The Paklenica Nature Park protects the surface of 95 square kilometers, with vertically carved canyons on the slopes of Velebit and the rest of the natural intact area around. The highest peaks of Velebit are Vaganski vrh (1757 m) and Sveto Brdo ( 1753 m) and they are not appropriate for beginners. Whether you are an experiences mountain climber or you just want to spend some time in the mountain, Paklenica will surely leave you in awe. Biokovo is the second- highest mountain range in Croatia, located on the Dalmatian coast of the Adriatic Sea, in between the rivers of Cetina and Neretva, and above the Makarska Riviera. At the highest peak of St. George at 1762. meters above sea level, it is even possible to see the Monte Gargano in Italy ( 252 km away) when the weather is clear enough. The 196 square kilometers of the mountain is protected as a nature park since 1981., hiding over 1500 plant and animal species, some of them being endemic. Biokovo is not easy to hike, so take care that you are prepared correctly to reach the peak that you want, without having to call in the rescue teams. 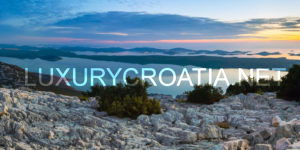 At the top however, you will be rewarded with the beautiful panorama of the rugged coastline and islands emerging from the Adriatic sea, Dalmatia’s hinterland and some mountains of Bosnia and Herzegovina and Italy. Biokovo has its depths as well, with over 400 caves that have been discovered, and there is even architecture of over 80 churches and chapels that have been found on the mountain. Some of the pits on Biokovo are hiding eternal ice and snow, with no sunshine that could melt them. It is a place of contrast between two climates, the Mediterranean and the continental one, creating a special atmosphere on Biokovo to experience. The Lake Vrana in Dalmatia is the largest natural lake in Croatia, located in the northern Dalmatia, between two historic cities on the Adriatic coast, Zadar and Sibenik. It has a lot of diversity of waters within a small distance thanks to its location. It is protected as a nature park in 1999. with an area of 57 square kilometers, with the lake taking 30 km square with the maximum depth of 4 meters. The lake is unique and protected because it is a karst valley, a rare example of a cryptodepression filled with mildly salt water that has developed some sea organisms. This makes it a geographical phenomenon, where the surface of water in the lake is above sea level, and the bottom of the lake is below sea level. It is filled with biodiversity, an almost intact natural habitat of birds and fish, and an important characteristic of the nature park is that it is a Ornithological reserve that has been included in the list of Important Bird Areas in Europe. It is a habitat for 4 species of bird that are endangered on European level, and for 7 bird species that are endangered on national level. In total, the park records over 230 different bird species, with 75 of them using Vransko Lake as their wintering grounds, making it one of the most important European wintering grounds of huge ecological value. Bird lovers will definitely cherish a visit to the lake, but the beauty of the Vransko Lake is not reserved only for these tourist. The Brijuni are a group of 14 islands, located on the north in the Adriatic Sea and one of the true jewels of Istrian region. The group of islands can be divided into two larger islands, the Veli Brijun and Mali Brijun, and 12 other, smaller islets, that were divided from the Istrian peninsula with a narrow Fazana channel. The scenic beauty of the island and the wonderful landscape make them a dream holiday resort and an officially protected National park of Croatia since 1983. The islands are a great example of nature that has grown under the influence of man, trying to provide the best possible stay in green vegetation and surrounded by crystal-clear blue sea. The flora and fauna of the islands are highly specific, and there are even preserved footprints of dinosaurs and reptiles coming from the Mesozoic era, a phenomenon that makes Brijuni interesting even from the paleontological point of view, a collection that is kept by the museum of Brijuni. The island of Veliki Brijuni even has a Safari park that was established in 1987., a place where you can see zebras, elephants and other autochthonous species of the Ethno Park, such as the Istrian cattle, goats, Istrian sheep “pramenka” and Istrian donkeys. Lastovo archipelago is the youngest Nature Park in Croatia, an island municipality in the Dubrovnik-Neretva County consisting of 44 islands with almost 200 square km covering archipelago of pure, untouched nature, 53 km square of this accounted for the mainland area. The largest of the islands are Lastovo and Susac. The Nature Park was named after the biggest island, Lastovo. This archipelago is one of the best preserved marine areas of the Adriatic Sea. The archipelago is protected with the idea of preserving the inherited landscape and cultural values, as much as the biodiversity, with the sea and submarine area. The islands have astonishing beauty, coming from the translucent blue sea, to the rocky coastline on to the greens of the land, the landscape is simply amazing.